One way to study the health of the Tallahassee real estate market is to compare single family permits and home sales in order to identify a trend in the accumulation or reduction in the supply of homes for sale. 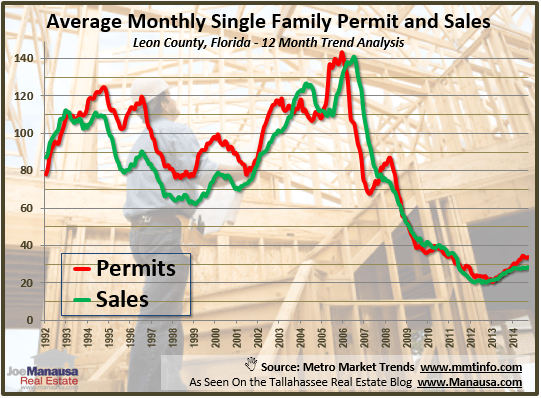 As you will see in our graph of permits and sales, the Tallahassee housing market is building new construction houses at near all-time low levels, which equates to roughly 30% of the pace that we saw in the 1990s. But a new trend is emerging, and it is one that could impact home values for both new and existing home sales. In the graph of building permits and new construction sales below, the average number of permits filed each month is shown in red, while the average number of new homes sold is shown in green. Whenever we see the green line rise above the red one, it means more homes are being sold than being permitted, thus there is a reduction in inventory. Conversely, when the red line rises above the green one, we are adding to the inventory of new homes for sale in Tallahassee. It is interesting to contrast the current market with how things looked back in the 1990s (a healthy market). New permits were constantly out-pacing new home sales, as the market was on the rise. There was a significant delta (difference) between permits and sales, and builders reacted and slowed permits whenever sales slowed down. But look how things have been since 2008. Permits and sales are recording zero delta, as speculative building has been limited during the housing market correction. Since the demand for homes has fallen to levels last seen in 1993, the need for new construction houses is only for the minority of homebuyers who demand to live in a brand new home. Right now, we are experiencing the largest delta between new permits and new construction sales in the past 6 years, and I hope the builders and bankers and keeping a close eye on inventory levels. The following table shows both the real and relative supply of homes by price range, in the Tallahassee real estate market. The highlighted column shows the months of supply (relative supply) of new homes for sale by price range. To the left of the highlighted column we see the overall relative supply. Anywhere this overall supply is below 6.0 months, we can say that the market is leaning towards a seller's market and builders should be able to sell new homes in Tallahassee. Since it is hard to bring a new home to the market for less than $125,000 (the cost of land, sticks, bricks, mortar and labor, etc makes it very difficult), builders are having to look well above the median home price and right now, we have a sufficient supply or more of these priced homes. Speculative building is still a risky proposition for home builders, and we won't get back to healthy market conditions until the normal demand for homes returns. If you are planning on buying a home, make sure you explore the risks and benefits of both new and used homes with your real estate buyer's agent. If you are planning on a move to Tallahassee, just drop me a note and we can schedule a time for you to explore all of your options and opportunities as a buyer in a buyer's market.